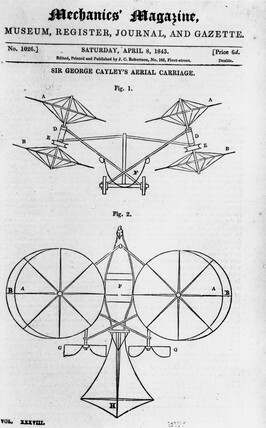 Sir George Cayley's proposed 'aerial Carriage' of 1843. Illustration taken from 'Mechanics Magazine'(1843). Sir George Cayley (1773-1857), English amateur scientist and aviation pioneer was responsible for designing the first man-carrying glider. In 1808, he constructed and flew a glider with a wing area of 300 square feet (27.9 square metres), probably the first practical heavier-than-air flying machine. This image shows his innovative 'aerial Carriage' of 1843. It incorporated four circular discs that were designed to raise the machine vertically, rather like a helicopter, whereupon they were to form circular wings. This ambitious design was never actually built but remains an example of Cayley's remarkable understanding of the principles of flight.